Opening later this week, End of the Line presents ‘'Shades of Things to Come'’, an exploration into the contemporary world of freehand graffiti. They have selected incredible artists from across Europe who they believe push the boundaries of freehand aerosol art. Each of the eight artists have a unique, individual style and represents a different discipline of dirty handstyles and technical dexterity. 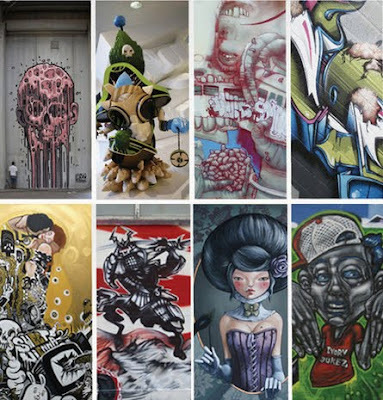 Artist's show include Tizer, Probs, Biser, Aryz, Nychos, Does, Rabodiga and Bom.K. The Maverik Showroom on Redchurch Street in Shoreditch will play host to this not-to-be-missed event. The entire gallery will be completely transformed with full-scale artwork, canvases, installations, sculpture, productions in mixed-media and artists in residence painting live over the course of the exhibition. Preview 24TH November 2009 - Doors open at 6PM. The show will run until the 29th November 2009.